The Masjid is situated in North Evington, Leicester and is able to host approximately 300 worshipers at one time. Serving the Islamic needs of children from all parts of Leicester with over 200 students currently enrolled in our Madrasah. Our Imaams conduct a Dars (Lesson) twice a week. 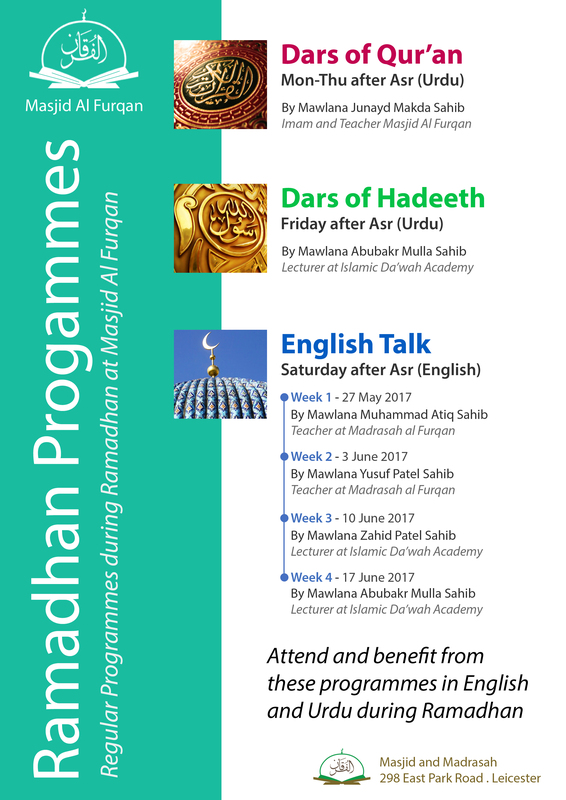 On Monday Dars-e-Quran in Urdu and on Wednesday in English. Masjid e Furqan is situated at 298 East Park Road, Leicester. The Masjid was established in 1997 in humble dwellings at the current site. The premises had facilities to cater for 60 musallis. As the need increased the Masjid took on renovation work to extend the premises to cater for the needs of the community. Today, the Masjid has two prayer halls which can host 300 musallis. There are two further properties to cater for the Madrasah needs.